Find Part 1 of “Do You Need Christmas, Too?” here. Sacrifice. Does it mean death? Yes. Does it mean life? Yes. As we reach out for the “hope of all hopes and dream of all dreams,” our full hands prevent us from clinging, really clinging, to the Prince of Peace, the Mighty God, the Counselor. I’m carrying fear this year with a little resentment. You may be grasping dreams that never flourished… or plans others won’t acknowledge… or wounds that can only be healed by forgiveness. You may be carrying good things that, over time, have come to replace your passion for the very One who breathed life into us. Mirriam-Webster understands the complexity of “sacrifice.” There’s the literal definition that points back to ancient worship — the slaughtering of life to present an offering to God. There’s pain and work and reflection all wrapped up in an act of humility to acknowledge there’s Someone bigger than yourself. To surrender to Someone bigger than yourself. And in that surrendering, we find redemption. Even Mary and Joseph, when presenting eight day-old baby Jesus to God in the temple, gave a sacrifice, an offering, out of their poverty. Trading uncleanliness for purification, they were to sacrifice a lamb plus a bird. Instead, they gave the offering of the poor — two birds. But we find less physical acts of sacrifice defined, too, like the “surrender of something for the sake of something else” and the choice to “suffer loss of, give up, renounce, injure, or destroy especially for an ideal, belief, or end.” And let’s pause while we wrap our minds are that. How do I surrender for the sake of something else? How do I make the choice to lose something, to destroy something, for what will stand in the end? How do I discern what’s worth giving up? What end, ideal, or belief is worth risking? And what about when the decision is made for me? To me? Is sacrifice death? Absolutely. It’s often as raw and messy — in a figurative sense — as the animal sacrifices of ancient years. There’s a carving of one’s heart as we slowly begin to align our passion with God’s desires. There’s pruning away that which prevents restoration, what prevents life. There’s letting go and releasing and submission and strength and courage and maturity all wrapped up in the dying. But, is it life, too? Yes. This life. It begins with God’s mercies and ends with His desires. This is the life my thirsty soul is craving. This is the life that looks nothing like what I pursue here. This is the life reminding me I was created for more than the brokenness I reach for. For Joseph, it was the mystery of fatherhood when he least expected it. It involved mentoring and teaching and raising up the One who had formed him in his mother’s womb. For Mary, it was never doubting she was seen and known by God. For the magi, it was dreams and studies fulfilled. And for the shepherds, it was inclusion in the most breathtaking way — being invited to the divine party and asked to dance. For us, might we reach out and catch the mercy? Might we lean into the intimacy of what’s sacred? Lean into Him who is sacred? Might we be transformed and have our thought process renewed? Might we crave what the God of the universe desires? Friend, I see your tender heart, weary from worry, craving relief. And I see you who are determined to live purposefully even though doors are slamming shut. And I see you who have reluctantly surrendered simply because you’re tired of fighting. I see you because I am you. But maybe, just maybe, the hunger and closed doors and weariness will show us something greater than our dreams of beauty ever could. Maybe they’ll show us our need for Jesus. Yes, come, all you who are thirsty, come to the waters. Journey toward the One who satisfies the deepest thirst — even when surrender is required. It’s a risk, for sure. But there’s more than enough in His deep, deep well of grace. For when we refuse to come to the water, He brings it to us. When we lack the courage to let go as our full hands carry the weight of misguided passions, He still reaches. He grasps us and holds us in the most intense, rescue sort of way. Gosh, I need Christmas this year. You, too? I need the Prince of Peace, and the perspective, and the reminder that there’s something bigger underneath the everyday. I need the challenge to slow down, to stop working, to stop striving so much. A year ago, I needed the Mighty God. I needed to know, to believe, “the power of leadership and the weight of authority” really did sit in His hands because I lacked strength like never before. That was the year I read Psalm 40 over and over, begging God to not let go because I certainly wasn’t “steady enough to continue the journey again.” I read that passage well into 2018. The year before that in 2016, I needed the Counselor at Christmastime. There was too much to navigate. There were too many questions and not enough answers and certainly not enough wisdom. Yes, I’ve needed peace, strength, and wisdom numerous times over the years — but never, ever would I have said I need sacrifice at Christmas. I can weave suffering and sacrifice into Easter, but Christmas? Yet the theme of surrender is imprinted on the hearts of all those in the Nativity story — Mary and Joseph and the magi and shepherds and all the unknown, unremembered people who were part of God’s great design we’ll never know. Mary radically surrendered to God’s plan, and Joseph eventually did, too. They risked their reputations in order to join God in His rescue plan despite all the glances and whispers and judgments made without the whole story. They exchanged people’s approval for the chance to help bring redemption to humanity. God’s hand pointed to a different path as their hands held their former dreams loosely. Sacrifice. The sacrifice of plans. The magi set aside their pursuit of knowledge and sacrificed their time. They exchanged prestige for humility, safety for risk, and became active participants in God’s rescue plan rather than just discussing it. All the years of reading and deciphering and wondering and dialogue — they boldly reimagined their purpose and became travelers and worshippers. Their role became even more radically defined as they stood up a power-hungry, blood-thirsty king to protect the very One humanity had waited for. Sacrifice. The sacrifice of time. The sacrifice of safety. And the shepherds, the ones in the margins of society, left their stations and risked not feeding their families that day. They walked away from their work — and maybe away from their paychecks — and ran toward mystery. Hearing God speak in the song of angels, they turned a deaf ear to the boundaries of society. Exchanging their social-class shame for the belief that God valued them, they joined His rescue plan and worshipped Him on that first night He kissed the world in the flesh. Sacrifice. The sacrifice of material security. Embracing the “hope of all hopes, dream of our dreams” meant sacrificing what all these used to hope for before they knew there could be more. A quiet family life built on tradition and hard work and religion… A life of research and study and academic discussions… A way to provide for their wives and feed their children — Mary and Joseph, the magi, and the shepherds traded it all to participate in something bigger than themselves. They sacrificed, and this sacrifice became their offering. Yes, I really need Christmas this year in the worst way. I’m anxious about my son and daughter — their present and their future — and I’m not quite sure how to guide them when I don’t have answers. Surrendering — when it involves my kids — is the hardest for me. And I want the quiet academic discussions instead of rolling up my sleeves. I want to live my life the way I planned instead of embracing what’s clearly given to me, forcing me to reimagine my purpose. It takes so much humility to surrender. And in a bizarre way, sometimes it feels safer to hide in my shame instead of living a life of passion. Maybe my sacrifice this year involves letting go of the way others define me, embracing vulnerability, and trusting God really will sustain me. It’s hard to let go of control. Those we hold dear… Career dreams… Relationships… Our place in the world, our place in society — Yes, I really do need Christmas — excuse me, I really need Jesus this year. So, what does sacrifice look like? Is it death? Is it life? I’m one of those. Unashamedly, I’m one who puts away Christmas as soon as I can. I’m not eager to sweep away the mystery or the miracle, but I’m hungry for new and will get there as soon as I can. There is, though, a crude little sculpture I can’t box away into months of darkness. Glance quickly and your mind plays a trick on you. You did, after all, see numerous Marys and Josephs and Babies last month. You can almost dismiss this clay as just another Nativity scene, but it’s not. Mary is on a donkey, yes. But she’s holding the Baby in her arms, and her womb is empty. The hope and wonder has been replaced by an overwhelming sense to rescue her son so He can rescue the world someday. See them fleeing Herod’s insatiable greed and insanity as they race to Egypt. 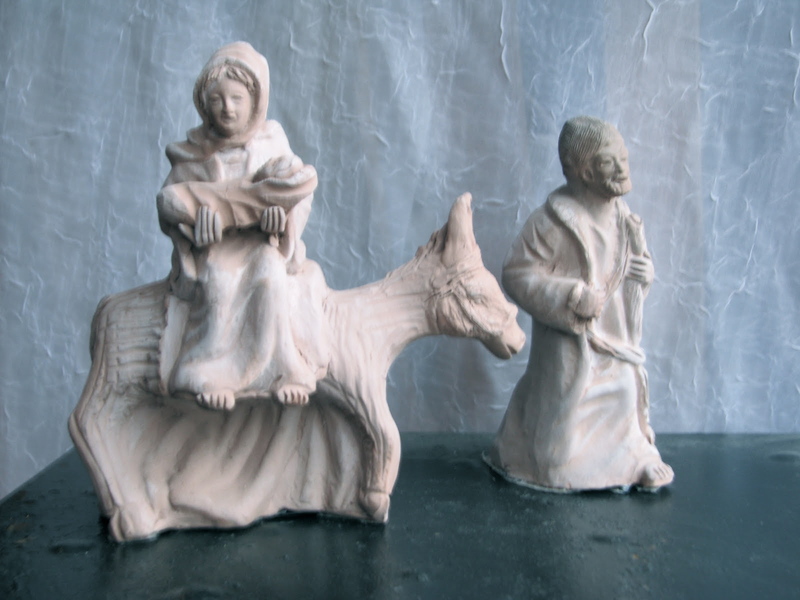 Joseph and Mary – and the Rescuer of the world – are refugees. Tired. Misplaced. Unsafe. And not in control. Are you not in control? I know. It’s terrible, isn’t it? Dear, dear Joseph has had quite a couple of years. Just a year or so ago he was well into a career designing and producing in his carpentry studio. And now the Master Artist is radically carving his life into something else. Does your life look different than you planned? Is your heart being carved? And Mary. Bless her. Her days were clearly not her own, either, and this escape to protect the Son of God must have seemed almost wrong. Did we misunderstand, Joseph? Truly we didn’t hear Yahweh clearly… Her journey to Bethlehem had been full of Hope and Promise kicking inside her. What life was she giving the toddler in her arms now? Have you ever felt inadequate? Do you maybe have regrets? Friend, look at the refugees, holding the Hope of the World in their arms, furiously determined to do their part in helping God heal the world. I love change. I’ve craved it. I’ve sought it many times. I’m simply fond of new. But I do see how much of my yearning is steeped in discontentment. Lord, quiet my restlessness. My infatuation reaches only to the point when I’m in control… when I’m the one dictating the change. I bow to the idol of control as I resist the Author’s twists on my story. I simmer in anxiety and drown those around me with it. I scorn brokenness without noticing the Carpenter wants to reform my heart. Wants to carve away the ugliness I crudely patched on myself. Have you ever felt the need to be repurposed? And though we’re refugees — tired, scared, numb — ultimately His plan is for us to travel right into His presence. Away from choices gone bad, away from insecurity and regret, away from misplaced treasures.